Calderpeel were appointed by Inacity at the initial feasibility design stage to develop a concept masterplan for a landmark hotel and residential development. We partnered Woods Bagott architects in the design of the 60-storey hotel and residential development through the planning process due to our experience with Manchester City Council to a successful outcome. The porte-cochere entrance to the hotel was a glass structure that anchored the tower at plaza level respecting and complimenting the grade 2 listed “The Place” building creating a courtyard. 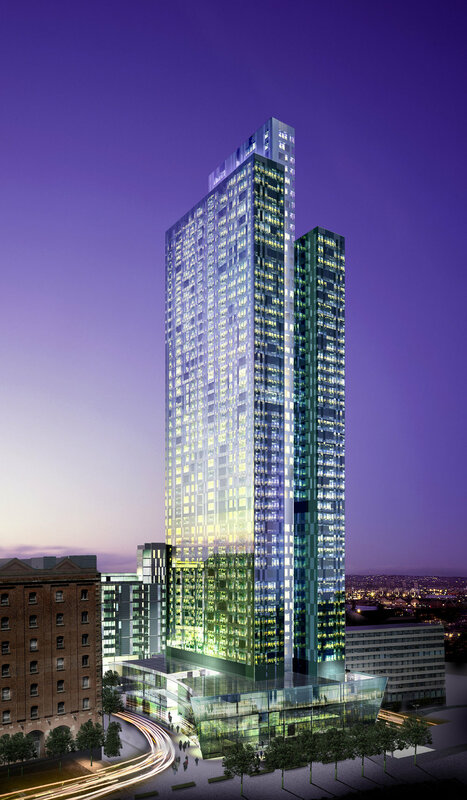 We partnered Woods Bagott architects in the design of the 60 storey hotel and residential development through the planning process due to our experience with Manchester City Council to a sucessful outcome. Calderpeel were appointed by Inacity at the initial feasibility design stage to develop a concept masterplan for a landmark hotel and residential development. We partnered Woods Bagott architects in the design of the 60-storey hotel and residential development through the planning process due to our experience with Manchester City Council to a successful outcome.